I made my Cheesy Mexican Rice and Black Beans last night to accompany grilled Mexican spiced pork chops with a side salad of mache greens, avocado, cilantro and scallion. The recipe yields a ton (especially when served as a side dish)...so with the leftovers, tonight's dinner will be Chicken Burritos with (you guessed it) Cheesy Mexican Rice and Black Beans! In a large pan, heat olive oil over medium heat. Add your onion and saute up until soft and translucent, about 5 minutes. Add your garlic and continue sauteing another 2 minutes. Add your jalapeno pepper if using. Add corn and stir well. Add chili powder and cumin and stir together to coat all ingredients with the spices. Add beans and can of tomatoes and green chilies. Stir together well. 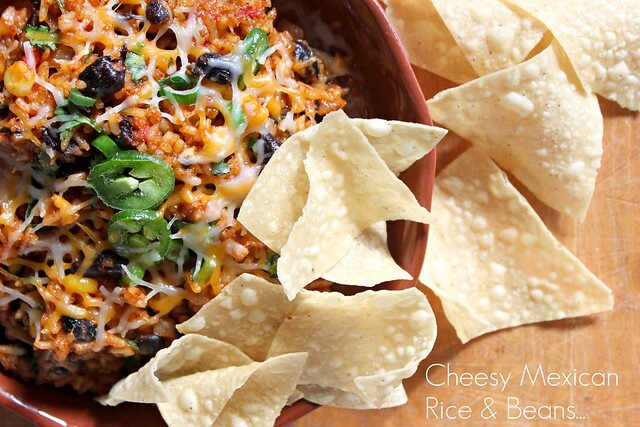 Add your prepared rice and fold together to incorporate all ingredients. Add cheese and stir together until cheese is mixed in well and melted. Salt and Pepper to taste only if needed. Sprinkle remaining cheese on top and cover the pan if you want some melted cheese on top. Serve with some or all of the following: chopped cilantro, scallion, sour cream, avocado slices and chips. This looks heavenly to me. Mexican food is one of my favorite cuisines!! I appreciate the rice tip since Trader Joe's is my go-to grocery store. this looks so gorgeous. 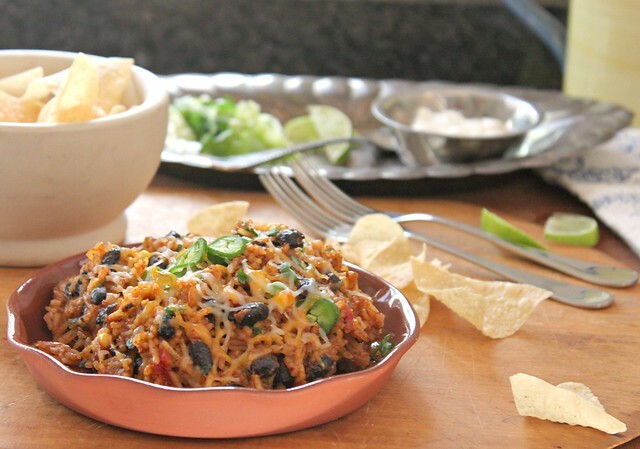 Mexican rice is one of my all time favourites, this is the best recipe ive come across! I love dishes like this. And by the way, those pork chops sound delicious. Please count me in next time. 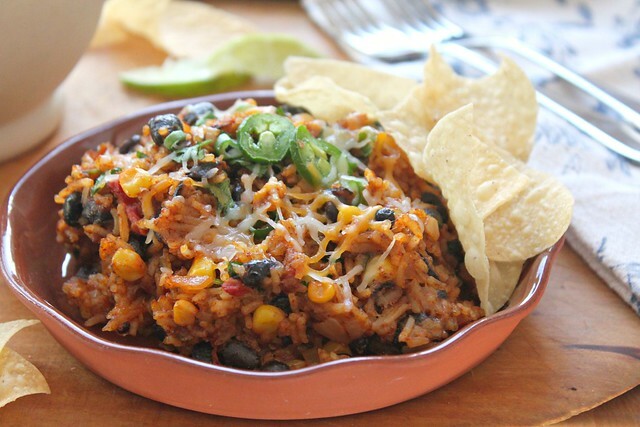 I love Mexican so this meal would be ideal for me! Oh yum! I need to get better at making mexican rice...my attempts so far have been less than great. This version looks perfect, especially cheesy! I love dishes like this - you can eat it as the main course or as a side dish. Versatility is key - and of course deliciousness doesn't hurt!